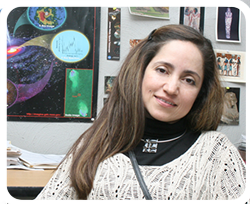 Dr. Bárbara S. Pichardo Silva studied the degree in Physics at the Faculty of Sciences of UAEM. She got her Master’s Degree and PhD in Sciences at the Institute of Astronomy of the UNAM. She completed three postdoctoral internships at the University of Wisconsin, USA, the University of Kentucky, USA, and the University of Zürich, Switzerland. Her field of specialty is stellar dynamics and she works on three branches from this field: galactic dynamics, disks dynamics on eccentric binary stars, and planetary disks dynamics in different Galaxy environments. Galactic structure, galaxies dynamics, planetary disks dynamics on individual and binary stars in different Galaxy regions.